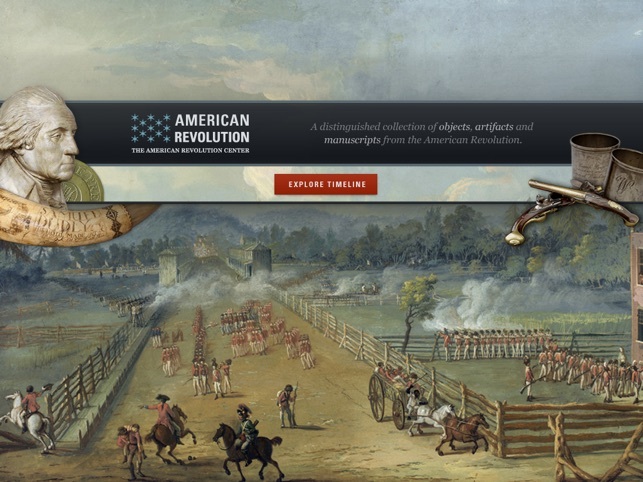 Summary : You can’t teach the American Revolution without this app! 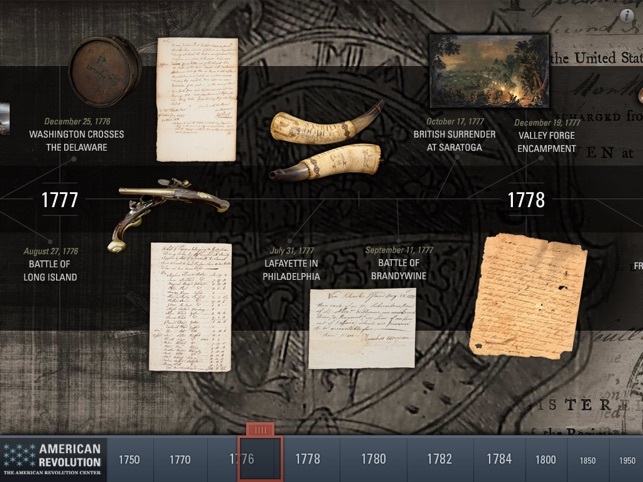 American Revolution Interactive Timeline for iPad presents users with a detailed timeline of American history from 1750-1784. (The timeline does extend from 1785-1900, but with less detail.) When perusing the timeline, users can view multiple types of artifacts that are from specific events. To examine an artifact, users must tap on it, and the app will magnify the artifact. Users can zoom in and out of the artifact, to examine it in detail. Plus, they can tap the “i” button on the bottom of the screen to access additional information about the app. 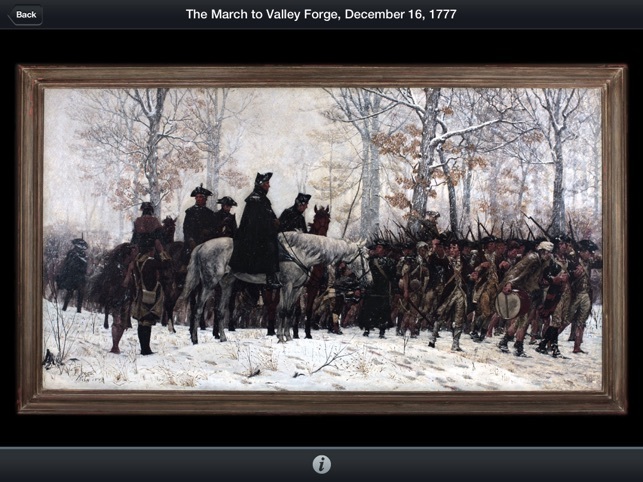 As teachers lecture about the American Revolution, they can use this app to highlight specific events and artifacts. Teachers can assign students a specific artifact and have them present it. As part of the presentation, students can read about the artifact in this app and then conduct additional research. Specifically, students can offer 1-3 examples about the significance of the artifact. Students can then find additional images online that represent the artifact, and then fashion those images into a presentation. Students can make their presentations using a Presentation app. 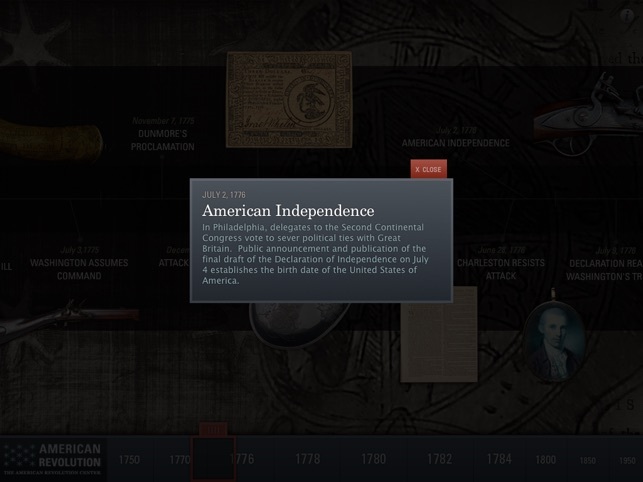 After students become familiar with the content of this app, teachers can create a class assignment where students make a timeline modeled after this app, but for a different time period (e.g., the 1960s, WWII, or the Nixon Administration). Students can collaborate to make their timeline using the PopBoardz, Weebly, or Jimdo app.